Also serving communities of Fort Washington. There are 107 Assisted Living Facilities in the Ambler area, with 2 in Ambler and 105 nearby. To help you with your search, browse the 553 reviews below for assisted living facilities in Ambler. On average, consumers rate assisted living in Ambler 4.7 out of 5 stars. Better rated regions include Bala Cynwyd with an average rating of 5.0 out of 5 stars. Caring.com has helped thousands of families find high-quality senior care. To speak with one of our Family Advisors about assisted living options and costs in Ambler, call (855) 863-8283. Ambler, Pa., is located just 16 miles from the center of Philadelphia, so it’s no surprise that it’s home to senior-friendly services and amenities such as senior centers and public transportation. Ambler has two assisted living facilities and another 56 located nearby. Also known as personal care homes, these facilities are regulated by the Pennsylvania Department of Human Services. Assisted living facilities offer assistance to seniors with activities associated with daily living such as dressing and bathing. Some have been designed to offer more specialized medical care to help seniors with disabilities. Ambler has an array of resources, including the Montgomery County Senior Adult Activities Center, which offers fitness sessions, a walking club, line dancing, yoga, Tai Chi, health screenings and health education courses. The center also offers trips to local farmers markets. The Ambler area is home to world-class medical facilities, including the American Family Care Urgent Care, in the event of medical emergencies or illness. It’s important for seniors to feel safe when going about their communities, and when it comes to safety, Ambler has an average crime rate of 1,182 per 100,000 people, which is considerably less than the national average of 2,837. Seniors planning to rely on public transportation have access to SEPTA Regional Rail and SEPTA Suburban Division bus routes. SEPTA provides free rides for seniors 65 and over. Ambler and neighboring communities feature multiple cultural attractions that seniors may enjoy such as the ACT II Playhouse and Ambler Theater. The cost of living index in Ambler is 119. This is considerably above the national average of 100. Seniors living on a fixed income may wish to take this into account. Assisted Living costs in Ambler start around $0 per month on average, while the nationwide average cost of assisted living is $4,000 per month, according to the latest figures from Genworth’s Cost of Care Survey. It’s important to note that assisted living rates in Ambler and the surrounding suburbs can vary widely based on factors such as location, the level of care needed, apartment size and the types of amenities offered at each community. 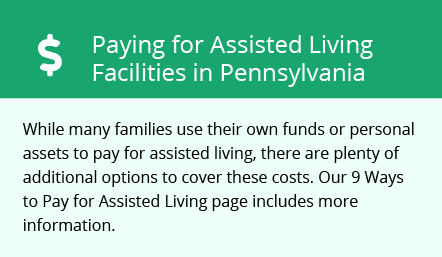 To date, Pennsylvania does not offer public financial assistance for care at an assisted living facility. The state only provides waivers for seniors who require support in their homes or need nursing home care. On the other hand, seniors who receive SSI benefits may qualify for the state to pay a supplement to an assisted living facility. Ambler and the surrounding area are home to numerous government agencies and non-profit organizations offering help for seniors searching for or currently residing in an assisted living community. These organizations can also provide assistance in a number of other eldercare services such as geriatric care management, elder law advice, estate planning, finding home care and health and wellness programs. To see a list of free assisted living resources in Ambler, please visit our Assisted Living in Pennsylvania page. Ambler-area assisted living communities must adhere to the comprehensive set of state laws and regulations that all assisted living communities in Pennsylvania are required to follow. Visit our Assisted Living in Pennsylvania page for more information about these laws.